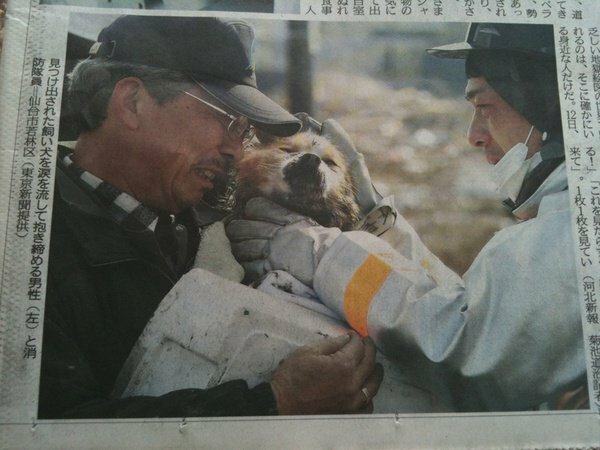 Everything going on in Japan is just so terrible, and so heartbreaking. Kelly and I know a number of people from Japan (like our property manager and the former organist at our church) or people who live or have lived in Japan (like Liz, Dan, and their kids). It just seems to get worse and worse too. But there is still cause for hope, I think. And there is much to be thankful for in our own lives. I saw this photo today, and it almost made me cry. This poor man is lucky to have his dog back, especially since he may well have lost everything else. Next Next post: Hair! And flowers.